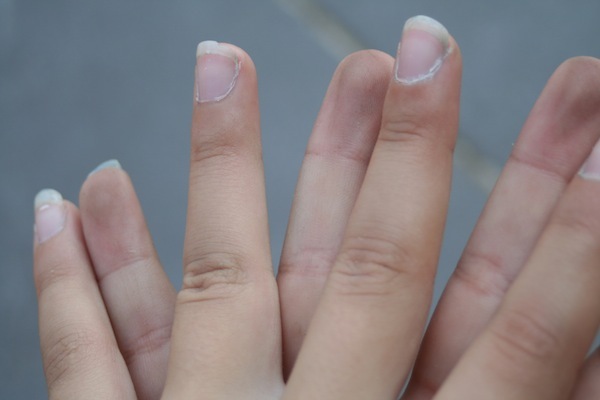 They say that a person’s fingernails tell how well that person takes care of himself. This in a way can be true. Sometimes, people tend to be busy doing all the work they can that fingernails are abused. The end result is brittle, weak and cracking nails. The appearance of such may not look aesthetically pleasing. It appears though as an effect of several factors. If you have the appearance of such, you never have to worry because there are steps to restore its health and to prevent further damage from coming. Usually, too much exposure to water would contribute to the weakening of nails. People who work with water like dishwashers, car washers and the like jeopardizes their nails. Water weakens nails because it sits in the nail beds and softens the cuticle which is intended to be hard enough. The best solution is to wear gloves when exposed to water. This applies to all too. Once you think, that you will be exposed to water for long, have your hands protected with gloves. Exposing your nails to chemicals will also cause harm to your fingernails. Making use of acetone most of the time to clear your nails from nail polishes may bring harm. The moment you expose your nails to something chemically prepared, you will get to expose it too to something that will take a part of your nails intended to make it stronger. If possible, leave your nails bare. If you are really into polishing your nails, give time for it to recover before applying another one. The reason why some nails break down is because of improper approaches. When you are grooming your nails, make sure that you are using the nail file in a proper way. It should only be filed in one direction to avoid nails from splitting. Perform it as slow as possible to avoid breaking down your nails. To maintain healthy fingernails, there is also a great deal over applying nail creams and lotions. It is advised to have it applied at night when the body is in relaxed state facilitating the regeneration of cells. Be amazed as you wake up in the morning feeling your hands soft. You may even feel like there is no way for brittleness to occur as your nails had an equal share of moisture. Vaseline and petroleum jelly can be used as a substitute for moisturizers. One can even use oils such as that of chamomile for a relaxing feel. Buffing nails would also be very helpful in bringing back the life of your nails. There are nail buffs available in the market that you can just readily use. These buffs facilitate circulation on the area around the fingers. Good circulation means that the nutrients are distributed equally. With this, you are sure that your nails will also have its fair share of nutrients that is needed to prevent it from breaking. A strong nail is one that is firm and strong enough to resist external traumas. All of the efforts you will do to avoid the occurrence of nail breakdown will all be put to waste if not coupled with proper diet. Diet also takes a part in the maintenance of the strength of fingernails. Since fingernails are parts of the body, it needs also to get a share from the nutrients taken in through foods. For brittle nails, the addition of Calcium rich foods may come essential. Foods such as milk and dairy products are just some of the sources of calcium one can take readily every day. Taking vitamins A, E and C is also vital to complete the purpose of maintaining healthy nails. As you take these healthy choices, you may even feel that your body has reacted so well that not only your nails are strengthened but also your hair and the different parts of the body. Performing the mentioned practices will always do you good. The results are crucial and that you will expect to get after a few days. Surely, you could not expect an overnight relief. But if the condition does not improve and that it worsens, it is time to visit your doctor. There are conditions affecting nails that cannot just be corrected by mere diet and protection. One of which is the presence of fungus on the nail beds. When you are suspecting this condition to occur, take medical advice. A medication regime might be introduced to correct the condition. Oh goodness! I’m in terrible need of a manicure! I really wish I could get my nails to grow longer. I guess I have problems because I wash my hands so much. My break pretty easily and I think it’s all the cleaning I have to do. Guess I need to tell my husband it’s time to hire a housekeeper. This is good info. It seems that whenever I get them all at a decent length, one of them breaks. Buffing does help, it makes nails look so shiny! My nails look so icky – I need to do some of these tips to make them look better. My nails have been great since I started taking vitamins. I really should wear gloves more often to protect mine from these hazards. Great tips! my nails always break! I can not stand nails. I cut mine really really short. I’m a super frequent hand washer so I’m sure my nails are probably on the weaker side. Mine are so fragile I just keep them chopped off! Wow! I wash my hands constantly and my nails always look awful. I never have time to keep up on them because of work. Thanks for writing this. I learned a lot! I need to take better care of my nails! Thank you for the tips this is always an issue for me. I so need a manicure. My nails are just busted. I’ve always had strong, healthy nails so I often take it for granted. Thanks for the tips! I’ve always had long nails every since I was in elementary. They are no fun, lol! Mine always tend to break really low and rip into the bed. Ouch! I just painted my nails yesterday for the first time in years but I usually don’t put polish on because my nails are pretty weak.